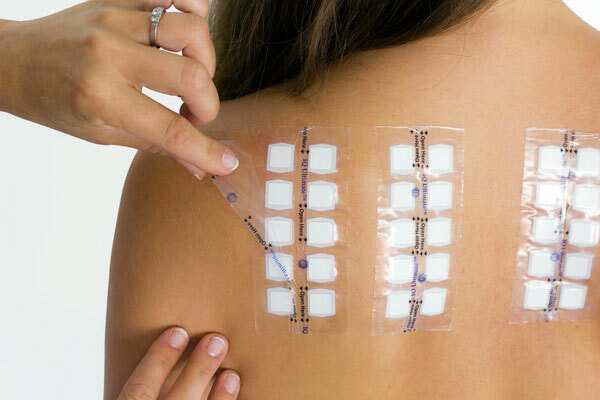 The IQ Ultimate™ patch test unit has important new features due to it’s new carrier tape. The test unit is based on the widely used IQ UltraTM. The three features below are unique for IQ UltimateTM. Each chamber is made of additive-free polyethylene plastic foam with a filter paper incorporated. The rim of each chamber has an adhesive layer to optimize adhesion to the skin and to eliminate leakage. This makes IQ Ultimate™ a closed-cell system enhancing occlusion and confining the test reaction within the chamber parameter. This feature is crucial in standardized patch testing which is based on the concept dose/area and the area has to be exactly defined. A hypoallergenic transparent carrier film is used for the IQ UltimateTM. Each strip of 10 chambers of IQ UltimateTM is attached to a protective plastic cover with corresponding compartments which makes it possible to re-attach the tape after advance filling of the chambers with the haptens. The IQ UltimateTM is supplied in cardboard boxes containing 100 units per box (100x10 chambers).